As I’ve mentioned before, I am a magazine junkie. Especially bead and papercrafts magazines. Well, right now I have a subscription to Bead Style Magazine, and usually I just leaf through it. This month, though, I saw the “Razzle Dazzle Bracelet” designed by Caroline Conley, and I knew I had to test it out! 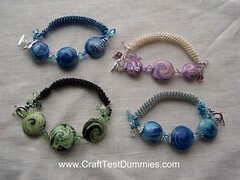 I love to make my polymer clay beads, and I’ve been working in sets. I’ve wanted to use them in bracelets, but wanted to make a more cuff/bangle style instead of just stringing them. I hadn’t found a design I really loved. Until I saw this one! 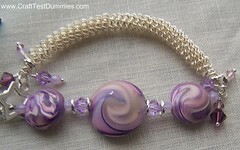 I really liked the bead combination, and the way it fit together, but the coil seemed to be out of proportion. I then realized I needed a smaller coiling mandrel – duh! And after a quick consult with Eva at Grand River Beads, I needed some smaller wire for the outside coil as well. So I got it all straighted out, and got on a roll. No pun intended! I love the way they are turning out, and I’m all jazzed up to do this as a class for GRB. If you are liking the design, I encourage you to pick up the May 2008 issue of BeadStyle and try it out for yourself. The instructions were clear, easy to follow, and easy enough for an experienced beginner. You need a Coiling Gizmo and need to know how to make it work, as well as crimping and wire wrapping. These bracelets are beautiful Jenny. My favorite by far is the green one. 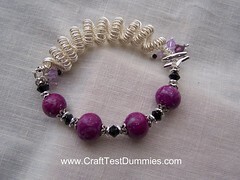 The black wire is a great contrast and I love your polymer clay lentil beads!